Random Views: Might it be a soft Brexit after all? So Theresa May surprised me after all. At the eleventh hour. As all seemed set to fall apart around her ears, burying her under the ruins. She’d claimed at the beginning of the week that she had a solution. Specifically, a means of keeping the border between the Republic of Ireland and Northern Ireland – the only land border between the EU and the UK – open. In other words, a way of allowing trade between the two parts of the island to continue unimpeded, without duties to pay or customs posts at which to wait. But then it emerged she’d only achieved that by offering to maintain parity in regulations between Northern Ireland and the Republic. In effect creating a border in the Irish Sea, between the whole of Ireland and the UK, instead of within the island. To her astonishment – apparently – the Democratic Unionist Party of Northern Ireland, on whose votes at Westminster she depends to keep her government in office, went ballistic. Arlene Foster, its leader, made it clear that her party’s continued support would be jeopardised by any such arrangement. I say “apparently” because it’s actually hard to believe that anyone could have been surprised. The Democratic Unionists emerged in opposition to the mainstream Ulster Unionists because they felt the latter weren’t unionist enough. In other words, the DUP was first, last and forever a party committed to the union between Northern Ireland and the United Kingdom. Nothing, but nothing, mattered more. It’s practically unimaginable that Theresa May has read so little Irish history but, hey, I never cease to be amazed by the sheer extent of her ineptitude, so maybe she really doesn’t know what tradition the DUP embodies. On Monday of this week, therefore, the whole deal looked set to unravel. And, since agreement on Ireland, was an absolute condition of allowing the Brexit negotiations to move on to discuss trade, it looked as though May was facing a sticky future indeed. Defy the DUP: how could she let her government fall? Allow the talks to collapse and make a hard Brexit certain: how could she allow the economy to suffer that level of damage? That’s where she surprised me. She came up with a different option. She made a full, unqualified and binding commitment to enter into a full, unqualified and binding commitment at some time in the future, and on terms yet to be agreed. It was splendid! And so EU. Fudge has always been the preferred mode of operation of the Union, as is hardly surprising when you’re trying to maintain consensus between 28 nations each intent on defending its own interest. 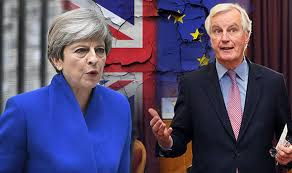 May even came up with this agreement to agree as we entered the final 72 hours to the deadline, and the only difference from previous EU negotiations is that they generally end after a final night of intense arguing just before the decision is formalised. Perhaps May knew well that the fudge was inevitable and felt she could do with a weekend. Why not agree on Friday rather than wait for Sunday? She’s had a torrid few months since losing her majority in an election she called injudiciously and fought incompetently. I expect she could do with a kip. Meanwhile, on the far right, its most outspoken figure, Nigel Farage, is furious. Although the final terms haven’t been defined, the fudge makes it clear that Britain will have to accept the need to keep its regulatory standards aligned with Europe’s, at least on any matter that might affect the Good Friday peace agreement in Ireland. In other words, Britain after leaving the EU will still have to obey many of its regulations – it will merely have given up having any say on them. The most encouraging aspect of this concession is that it might lead to something far more like a soft Brexit, where Britain remains closely aligned with the EU, in spite of the Brexiters. It will be a pity to have no say in making the rules, but even without that say, Britain will be far stronger for maintaining such a close relationship with its major trading partners. On the other two substantive points of the deal, Britain has agreed to pay a lot more money than Brexiters throught we’d ever have to, and has even had to accept that the European Court of Justice would have some jurisdiction in Britain, over the way we treat EU citizens living here. That was enough to make Farage apoplectic, which in itself is enough to make me like the terms. On the other hand, I can see his point. On all these terms, May has had to abandon her “red lines” and compromise with the EU. The EU has negotiated effectively and forced Britain to move further towards its positions than it has moved towards Britain’s. If these commitments to commit turn into real commitments the impact could be massive. First of all, the US has made it clear that the trade deal that Brexiters have been relying on as their get-out-of-Brexit-free card will require Britain to align its regulations with American ones. Well, that wouldn’t happen. Secondly, Britain has had to accept, explicitly at last, that it isn’t a lion roaring on the global stage, harkened to by everyone. If it’s a lion at all, it’s a much reduced one, its teeth and claws gone, having to supplicate rather than dictate. Britain has had to bow to EU demands, not the other way around. That’s an invaluable lesson for Britons to learn, and long overdue. In any case, anything that wipes the self-satisfied smile from Nigel Farage’s face, however temporarily, has to be deeply satisfying. A fine way to start the weekend. Are you sure, I think absolutely nothing was agreed other that a form of ambiguous words that didn’t offend the other side but allowed total wriggle room in any future conversation on a non binding vague conversation. Time will tell but time is a long long way off yet. 1. Britain isn't running the table. It has to make concessions. 2. To make the whole thing work at all, we're going to have to accept quite a lot of parity with the EU on regulations. Which will help us dodge a bullet in trade terms but leave us in the stupid position of having got no independence from Brexit, merely lost our voice in determining the regulations we live by. In other words, we may avoid the worst consequences of Brexit, and by doing so, made its ridiculous nature clearer than ever. OK I agree with most of that but not all. Tell me what is your prediction as to how the rest of the game will play out and what the end result will be. The way I think it may play out is that Britain will make further concessions - bigger concessions than the EU will make, though it too will move away a little from its starting position: in other words, we shall see a classic negotiation between a powerful party and a weaker one, in which the UK will at last begin to understand that it arguing from a weak position. The effect of that will be to come up with a deal which will leave us with some at least of the advantages of EU membership, in the arena of trade at any rate, perhaps even in freedom of movement, at the cost of our accepting things that to the more passionate Brexiters will seem intolerable. With support from the majority of both the Labour and Conservative parties, such a deal could get parliamentary approval. Hence my belief that a glimmer of hope has appeared. However, what it will mean is that the major conflict will become one between diehard Brexiters and the rest. They're powerful, they're passionate, they're united in pursuit of one, simple aim. I can't say with certainty they'll be beaten. Amusingly, ironically indeed, they may end up being the people demanding a new referendum. That would be a vote to give the electorate not the right to reject Brexit altogether, but to choose between whatever the government negotiates and a hard Brexit. I can't pretend to know how that would turn out (the conflict: there might or might not be a referendum, and I'm not sure how that would turn out either). I'm not sure if that feels too much like an evasion to you. It really is as definitive as I can be - and I really can't be definitive.